The Tigers managed to play 27 games over three months without suffering that most insidious of maladies: "the bad loss." Don't tell the Houston Cougars (now 11-4 in the cozy, near-empty confines of Hofheinz Pavilion), but tonight's defeat will hurt more than any of the Tigers' previous six. With tip-off against 7th-ranked Louisville less than 48 hours away, Memphis coach Josh Pastner has to hope his charges gain in motivation what they may have lost in spirit tonight. The Tigers were never able to gain a significant lead (there were a total of 13 lead changes in the game), and suffered a 10-0 Houston run that bridged halftime and gave the Cougars a 40-33 edge early in the second half. Danuel House (19 points) and Jherrod Stiggers (14 points, four treys) provided the offensive punch behind Houston's all-conference candidate, TaShawn Thomas (16 points, 7 rebounds). House's three-pointer with 2:10 to play extended the Cougars' lead to five (68-63). Then, over the game's final 90 seconds, the Cougars hit nine of 11 free throws while the Tigers were unable to connect from long range or inside to close the gap. The Tigers actually converted more field goals than Houston (28-24) but gave up eight three-pointers (while making three) and suffered a huge disparity in free throws, the Cougars hitting twice as many (21) as the Tigers took (nine for 10). 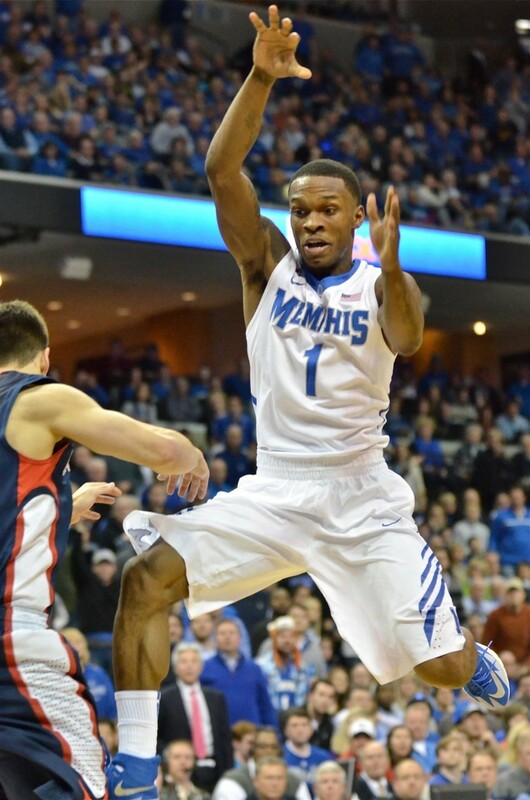 Michael Dixon led Memphis with 19 points off the bench. Shaq Goodwin scored 16 and pulled down 10 rebounds before fouling out late in the contest. Freshman forward Austin Nichols added 12 points (eight of them in the game's first six minutes). Joe Jackson, Chris Crawford, and Geron Johnson combined to make only four of 15 shots from the field. The loss drops the 21st-ranked Tigers to 21-7 and hurts their chances for securing a coveted top-three seed in the American Athletic Conference tournament. Now 10-5 in league play, the Tigers finish the regular season with three games against teams that have been ranked this season: Louisville (Saturday), Cincinnati (next Thursday), and SMU (March 8th). Houston improves to 14-14 with the victory (6-9 in the AAC). If You're Retiring Larry Kenon's Number . . .
I’m happy for Larry Kenon. By the time you finish this column, you may have your doubts. But I really am happy for Larry Kenon. This Saturday, when the Memphis Tigers host arch-rival Louisville at FedExForum, Kenon will be given the highest honor an athlete can be given by a team when his uniform number (35) is retired and raised to the rafters. Kenon will join eight other Tiger greats — including two teammates — in the pantheon of Memphis basketball elite. Should you need a refresher, Kenon starred alongside Larry Finch and Ronnie Robinson for the 1972-73 Tiger team — then Memphis State — that advanced to the NCAA tournament’s championship game before bowing to John Wooden, Bill Walton, and mighty UCLA. Kenon averaged 20.1 points and 16.7 rebounds in 30 games for that legendary team, a group as important for the community cohesion it inspired as for its 24 wins on the hardwood. Kenon’s star shone especially bright in the national semifinals when he scored 28 points and pulled down 22 rebounds — his seventh 20-20 game that season — against Providence. He set a Tiger record for total rebounds that season (501) that remains 129 more than any other Memphis player has grabbed. Kenon was a spectacular component of a spectacular team in 1972-73. Some of those who saw him play here insist Kenon — pound for pound — remains the greatest player to ever wear a Tiger uniform. Trouble is, that was his only season in Memphis. Thirty games. A year later, Kenon was running the floor with Julius Erving and the New York Nets on his way to an ABA championship. He went on to play in three ABA All-Star Games and two NBA All-Star Games as a member of the San Antonio Spurs. Kenon is a great former Tiger, by all measures. But worthy of inclusion in the program’s most esteemed fraternity? I take the retiring of numbers more seriously than I probably should, and I have a fundamental problem with college programs honoring players who spend but one season in uniform. Compounding matters here, the Memphis program has several players who starred for more than one season, in eras that haven’t been honored enough . . . or at all. • Antonio Anderson (#5, 2005-09) — I made a lengthy case for Anderson two years ago, and he remains atop the list of former players who would receive my vote (if I had one) for a retired number. He is the only Tiger to accumulate 1,000 career points along with 500 rebounds and 500 assists. Those are significant numbers, and Anderson is a club of one. He played in more games (150) than any other Tiger. Most importantly, the Tigers won at least 33 games all four years he played. That era needs to be acknowledged. 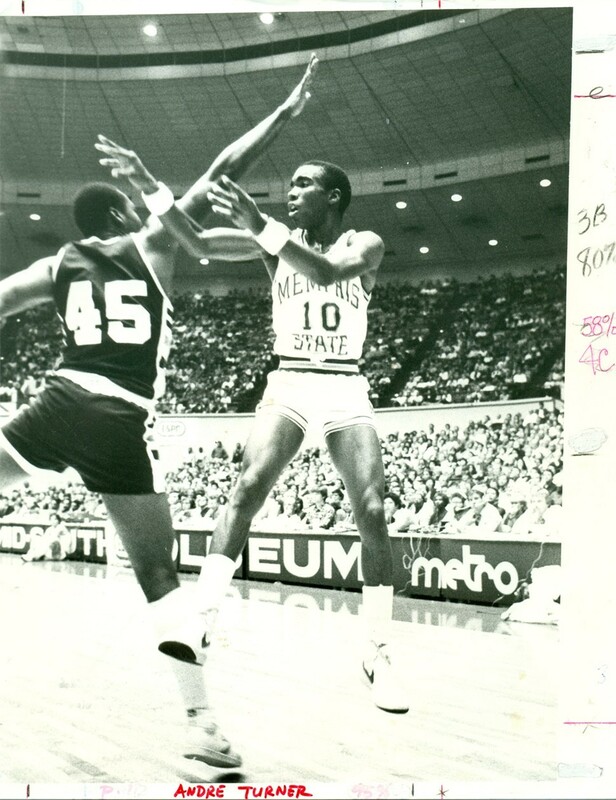 • Andre Turner (#10, 1982-86) — Impressed with Kenon’s single-season rebound record? 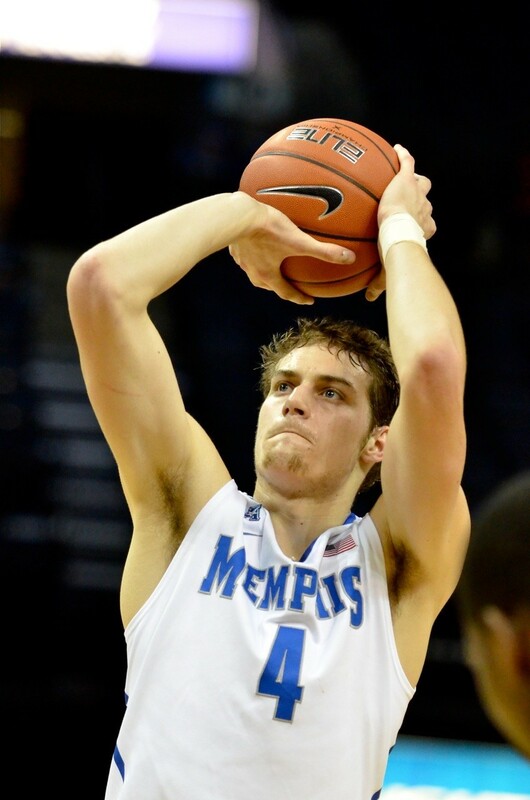 Turner’s career assist mark (763) won’t be touched; the second-most in Memphis history is 639 (Chris Garner). The Little General led the Tigers to the Sweet 16 three times and was a late-game hero (twice) in the team’s run to the 1985 Final Four. If the 1973 team has three players in the rafters, it’s about time Lee is joined by a teammate from ’85. • Chris Douglas-Roberts (#14, 2005-08) — There have been only three Memphis players to earn first-team All-America recognition from the Associated Press: Keith Lee, Penny Hardaway, and CDR. The first two have had their numbers hanging above the crowd at FedExForum for 20 years. And neither of them played in a national championship game. (Kenon was honorable mention in 1973.) Despite playing only three years in Memphis, CDR is 10th on the career-scoring chart and is one of four Tigers to score 700 points in a season. As Kenon’s jersey joins eight others in the FedExForum rafters, here’s hoping the Memphis program reconsiders a few other deserving honorees. Take down a few of those (non-championship) NIT banners, and there’s plenty of room. Over his first four seasons as a head coach, Josh Pastner was Conference USA's top spokesman, selling his team's league as being far superior to its reputation. Keeping with that approach, it seems Pastner's Tigers are now doing what they can to sell the rest of the country on the top-to-bottom strength of the American Athletic Conference. Two nights after escaping Rutgers (now 10-17) with a five-point win, the U of M needed overtime to beat a Temple team that entered play tonight sporting a record of 7-18. Senior guard Joe Jackson finally gave the Tigers the lead for good (78-77) by converting a driving layup to the front of the rim with 2:33 left in the extra period. Following a Temple turnover, sophomore forward Shaq Goodwin got inside for a dunk (on a feed from Jackson) for the final two of his 20 points, all but two of them coming after halftime. Goodwin was ferocious over a six-minute stretch late in the second half, hitting five field goals (three of them dunks) as the teams essentially traded baskets over the game's final ten minutes. Temple had chance to win the game at the end of regulation but a short jumper by Owl guard Will Cummings (24 points on the night) missed its target. A desperation three-point attempt by Austin Nichols — the Tigers' star of the game — was well off the mark as the buzzer sounded with the game tied at 74. "People try to overlook Temple, like they didn't just beat SMU," said Goodwin. "Every team in this conference is a good team. You can't take any team likely." As for his second-half explosion, Goodwin said, "I just try to keep my head, stay with the game plan. Things usually open up in the second half. Stay level-headed and do the best I can do." Goodwin's partner in crime in the frontcourt, Nichols, tallied the first double-double of his college career, and almost made it the Memphis program's fourth triple double: 17 points, 12 rebounds, 7 blocks. "Awesome, awesome," said Goodwin. "He just does what he has to do. Some games, he doesn't have to score that many points. But tonight, with mismatches, we tried to go to him every play." The Tigers shot 57 percent from the floor and dominated the game inside, outscoring the Owls 56-36 in the paint. But Temple managed to hit 11 three-pointers (on 31 attempts) and the Tigers missed 12 of 21 free throws to keep things far too interesting for a FedExForum crowd of 18,172. "We were fortunate to stop them when we needed to, and get away with the win," conceded Tiger guard Michael Dixon, who scored 12 points off the bench. "A lot of their shots, we had hands in their faces; they were just able to knock them down. They got a couple of big offensive rebounds we should have come away with." And about those struggles at the foul line? "We've got to do a better job," said Dixon. "You gotta go up there, take a deep breath, bend your knees, and get good arc on the ball. If you stress on it, it can become magnified. It's a free shot. You gotta make it. Gotta have the right guys up there." Jackson scored 12 points and handed out eight assists for the Tigers while Geron Johnson added 10 points. Quenton Decosey (23) and Dalton Pepper (20) were among three Owls to score at least 20 points. The victory improves the Tigers' record to 21-6 and 10-4 in AAC play. They'll travel to Houston for their next game on Thursday. 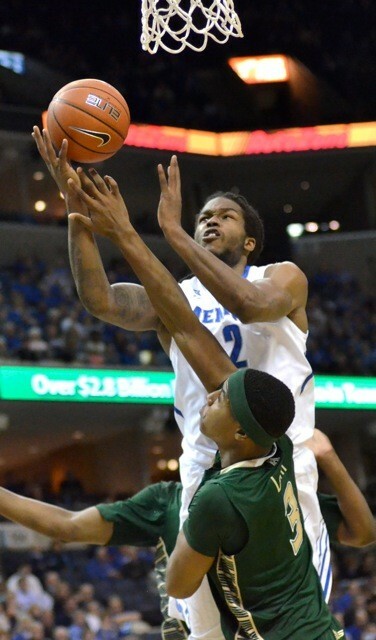 Memphis beat the Cougars by 23 at FedExForum January 23rd. 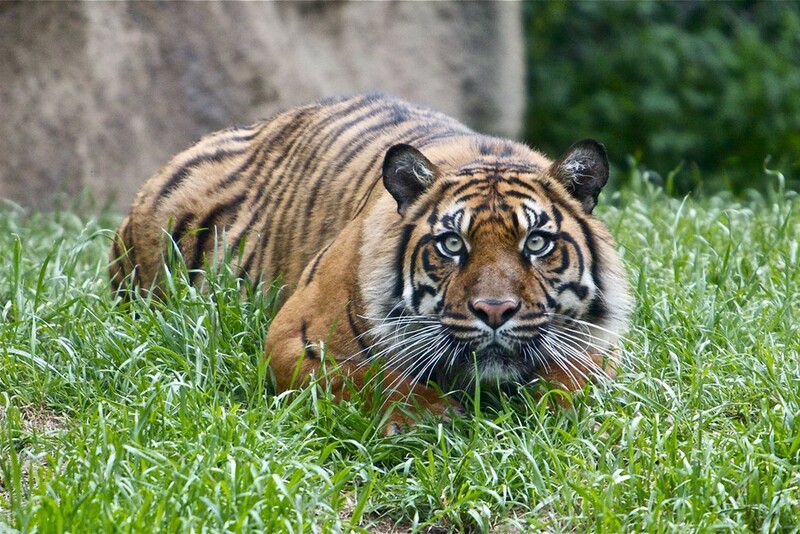 The 22nd-ranked Tigers have seen their fill of Piscataway, New Jersey. Having played one of their finest games of the season last Saturday in an overtime loss at UConn, Memphis allowed one of the worst teams in the American Athletic Conference to compete until the final buzzer. A Scarlet Knight team that lost to the Tigers by 32 on February 4th and by 48 just last Sunday to Louisville pulled within three points — on a long-distance heave by Myles Mack — with four seconds to play. Tiger senior Geron Johnson hit a pair of free throws, though, to seal his team's 20th win of the season. The game had the elegance of a Jersey strip mall from the outset. Memphis shot 41 percent from the field in the first half, which was actually a high figure when you consider senior point guard Joe Jackson missed nine of his ten field goal attempts before the break. Rutgers was no better (31 percent), but enjoyed a 10-2 run over a six-minute stretch to close the Tiger lead to seven (28-21) after 20 minutes. A Kadeem Jack drive brought the Scarlet Knights within four points (53-49) with 2:35 seconds to play, but the Tigers' Michael Dixon buried a three pointer beyond the top of the key to extend the Memphis lead to 59-51 with 1:16 left. Dixon led the Tigers with 15 points (13 after halftime), while Jackson scored 11. Tiger big men Shaq Goodwin and Austin Nichols each tallied 10 points. Jack led Rutgers with 22 points and 10 rebounds. The Scarlet Knights fell to 4-10 in their first and last season as members of the American Athletic Conference. Next season, they'll host the likes of Michigan State, Ohio State, and Indiana as members of the Big 10. 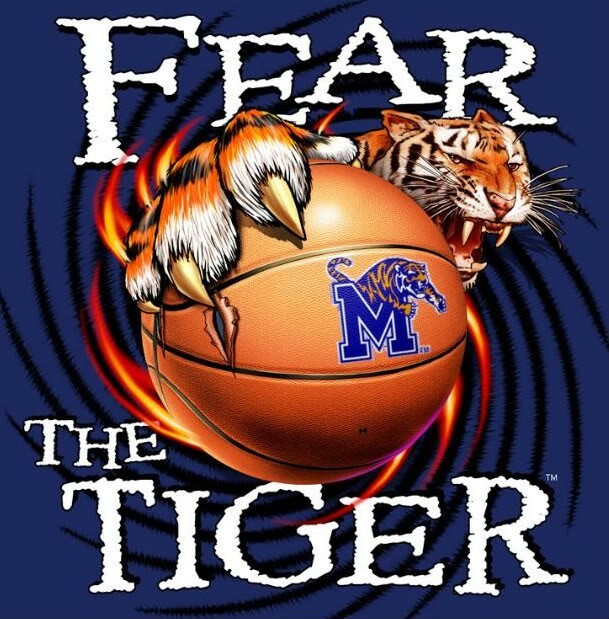 The victory gives the Memphis program 14 consecutive 20-win seasons and ties coach Josh Pastner with former Memphis coach Dana Kirk at five such campaigns. 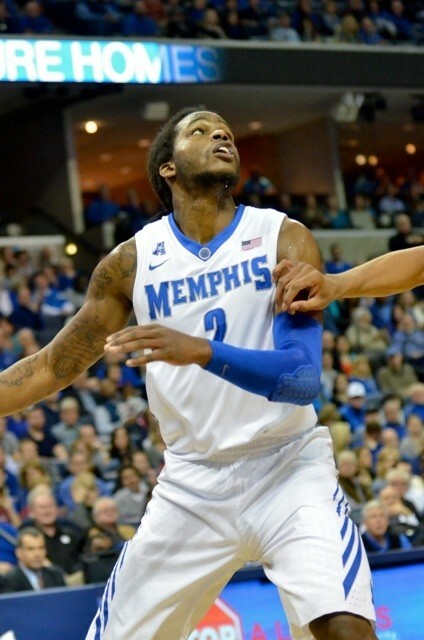 Now 9-4 in the AAC, the Tigers return to FedExForum Saturday night for a tilt with Temple. The Tigers traveled to Storrs, Connecticut, and played one of their finest games of the season Saturday, their acclaimed quartet of senior guards combining to score 61 points. Trouble was, UConn had Shabazz Napier. The Huskies' senior star — a leading candidate for American Athletic Conference Player of the Year — scored a career-high 34 points, including a three-point play with 52 seconds left to tie the game. Napier's deep three-pointer with 1:45 to play in overtime extended UConn's lead to five (79-74) and all but clinched the Huskies' 20th win of the season. This was late-March basketball in mid-February. UConn reeled off a 15-0 run midway through the first half to take a 23-14 lead, only to watch Memphis — behind an energized Geron Johnson — counter with an 11-0 run. An Austin Nichols dunk brought the Tigers within one at halftime (36-35) and a Chris Crawford trey gave Memphis a 46-43 lead early in the second half. But the Huskies then enjoyed a 15-5 run, thanks largely to seven straight points from Napier. Michael Dixon drilled a three-pointer to pull the Tigers within one (62-61) with seven minutes left in the game, and Memphis finally took the lead on a slicing layup by Joe Jackson with 2:35 left. Jackson found David Pellom for a dunk a minute later to give the Tigers a three-point advantage, but the play was merely prelude to Napier's heroics to force overtime. Shaq Goodwin drove to the rim but had his shot blocked cleanly with just under 20 seconds on the clock. A long three-point attempt by Napier rattled around the rim before falling out as regulation play ended. The Huskies outscored the Tigers 17-12 in the extra period. Johnson played his finest game of the season, finishing with 15 points and 8 rebounds before fouling out early in overtime. Jackson scored a season-high 24 points, with Crawford adding 12 and Dixon 10 off the bench. Ryan Boatright complemented Napier's performance with 21 points, including 11 of 12 shots from the free throw line. UConn hit 29 of 36 free throws for the game, while Memphis connected on six of nine. The loss drops the 20th-ranked Tigers (19-6) to 8-4 in AAC play, all but eliminating their chances for the first league title. They're now 3-3 this season against teams ranked in the Top 25 at the time of play. The 24th-ranked Huskies improve to 20-5, also 8-4 in the AAC. 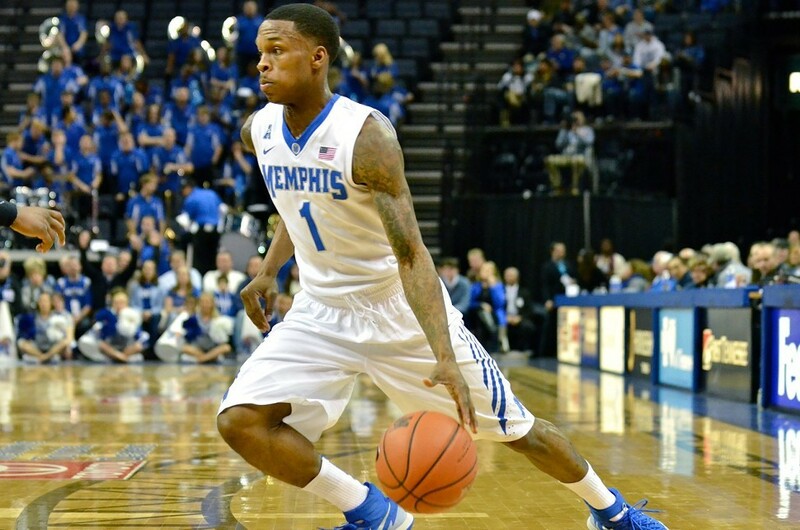 Memphis will next travel to Rutgers and face the Scarlet Knights on Thursday. They return home next Saturday to host Temple at FedExForum. Among college basketball teams on nine-game losing streaks, the UCF Knights have to be the best in the country. For the second time in two weeks, Isaiah Sykes and friends battled the nationally ranked Memphis Tigers well into the second half before succumbing. The visitors outrebounded the Tigers (39-27) and outscored Memphis 48-44 in the paint, just enough to test the nerves of 15,021 fans at FedExForum. With the score tied at 48 and 9:05 to play in the game, senior guard Chris Crawford received a pass in the left corner and did what such moments require: He buried a three-pointer to finally lift that crowd from their 15,021 seats. Fellow senior Joe Jackson snagged an offensive rebound and rose to convert a bank shot, then Michael Dixon — one more senior guard — connected to extend the Memphis lead to seven (59-52) with 4:40 to play. By the time reserve center David Pellom delivered a breakaway dunk with 3:29 left, the Tigers had enjoyed an 18-8 run over an eight-minute stretch to clinch their 19th win of the season. "My teammates just found me," said Crawford after the game. "That was a big three; we needed it. But it all starts on the defensive end. We got some stops there, got out in transition for some easy buckets. Our defense carried over to our offense. They're better than their record, but as a group, I didn't feel like we had as much energy out there tonight as we could have. We've got a couple of days to get ready, and we'll be ready to play Saturday." Thanks largely to Sykes (14 points) and Tristan Spurlock (18 points and 10 rebounds), the Knights fought back from a 13-point first-half deficit to take the lead (39-38) five minutes into the second half. But UCF misfired from three-point range (4 for 17) and committed 15 turnovers (seven of them by Sykes), leaving enough opening for the 20th-ranked Tigers to prevail for the 16th time in 17 meetings between the two former C-USA programs. Senior guard Joe Jackson led Memphis with 18 points and moved past Chris Douglas-Roberts into ninth place on the U of M career scoring chart. (With 1,559 points, Jackson trails Bill Cook by 70.) Shaq Goodwin contributed 14 points, six rebounds, four assists, and a pair of blocks, and Crawford and Dixon each scored 10 points. "I'm thankful for the win," said Goodwin. "Basketball's a game of runs. They went on a run, then we went on a run. They got a lot of offensive rebounds . [Coach Josh Pastner] wasn't happy at all with that, but he's happy with the win." The Tigers improved to 8-3 in American Athletic Conference play, still two games in the loss column behind Cincinnati with seven regular-season games to play. They'll travel to UConn Saturday for a chance to avenge the 10-point loss to the Huskies at FedExForum on January 16th. Joe Jackson will not forget his 22nd birthday. Neither will 7'1" Gonzaga center Przemek Karnowski. For that matter, 18,248 Tiger basketball fans were prepared to line up and light candles after Saturday night's comeback win at FedExForum. The memories will have little to do with the 10 points the Tigers' top scorer put on the board. It's the two points the 6'1" guard kept off the board. With the Tigers clinging to life, down 42-31 with 13:45 to play, Jackson swept down to the baseline as a backside defender. When Karnowski rose to dunk the ball after a feed from David Stockton, Jackson rose with him and and picked up his second blocked shot of the season (and 19th of his college career). The ensuing roar shook FedExForum, energized a national TV audience, and sparked the U of M toward a 29-12 run to finish the game and hand the 23rd-ranked Zags only their fourth defeat of the season. The victory gives Jackson and fellow seniors Chris Crawford and Trey Draper 100 wins for their careers in blue and gray. "Shaq Goodwin has a bad habit of gambling," said Jackson with a smile after the game. "He fronted the post, and I knew that was John Stockton's son making that pass. I just tried to make a play on the ball. Honestly, I was trying not to get dunked on; he was so close to the rim. I jumped to block it and I was successful that time. That kind of changed the game." The Zags took an early lead, allowed Memphis to reel off 11 straight points, then scored 12 straight themselves in a less-than-fluid first half that saw the Tigers shoot 26 percent and the Zags miss seven of eight three-point attempts. (Gonzaga led 25-22 at halftime.) Steady inside play from Karnowski (12 points) and Sam Dower (18 points on 9 of 12 shooting) helped Gonzaga to that 12-point lead before the block heard 'round the Bluff City. Freshman Nick King stayed on the floor for most of the second half, contributing seven rebounds (four of them on the offensive end) and six points. He was the central character in Tiger coach Josh Pastner's rather brilliant management of a rotation damaged by foul trouble (to Shaq Goodwin), injury (David Pellom's sore knee), and ejection (Dominic Woodson after a flagrant foul against Karnowski early in the second half). "Nick King came in and gave us a huge spark," said Pastner. "Fifty-fifty balls. He stayed ready, came in, and did his job. He was an energy changer." King's extended minutes came at the expense of senior guard Geron Johnson, who played a season-low 18 minutes. "That win was based on guts," added Pastner. "We learned from our losses to Cincinnati and UConn, and didn't allow an avalanche after we got hit in the mouth. The fans were tremendous; loudest I've heard it here. And winning in front of that 1973 team was really special. It was as fun a game as I've been involved with." Living members of the 1972-73 NCAA runner-up team were saluted at halftime, joined by the widows of Gene Bartow and Larry Finch. Considering the late comeback — Memphis outscored the Zags 17-4 over the game's final 5:45 — you had the feeling the spirit of Finch, Bartow, and Ronnie Robinson were very much in play at the corner of Beale and Third. "This was one of the best wins of the year, and I'm just so happy," said guard Michael Dixon, who scored on a fastbreak layup with just over a minute to play to give the Tigers a 55-54 lead. "A lot of guys stepped up. Nick King. Dominic Woodson. We stuck to the plan. One thing you can always control is your defensive intensity. We didn't fold and came away with the win." And Jackson's big block? "There were so many huge plays in this game, but that was probably the biggest," said Dixon. "Joe's an athletic guy, but it threw me for a loop. He came out of nowhere. Joe wants to win. He's a warrior and he made a huge play." The Tigers held Gonzaga — a team that came in averaging 7.8 three-pointers per game — to 2-for-16 shooting beyond the arc. Precisely the prescription for victory, according to Pastner. "I told the guys, 'Do not let them get threes.' They can score all the two-point field goals they want. But we had to take the three out. We were able to stay at home on their shooters. Michael Dixon was really big defensively." Crawford hit three three-pointers and tied Dixon for a team-high 11 points. (He hit a pair of free throws in the final minute despite a severe calf cramp.) Goodwin added 10 points, 8 rebounds, and 3 blocks despite being limited to 28 minutes for his four fouls. The 24th-ranked Tigers improved to 18-5 with the win and will return to American Athletic Conference play Wednesday night when UCF visits FedExForum. For a team and young coach hungry for defining wins, a comeback in early February with ESPN's "GameDay" crew in the building could do wonders come seeding time for the NCAA tournament in March. One blocked shot — by an unlikely defender — could go a very long way. As the Tigers cling to membership in the country's Top 25, they've come to establish themselves as masters of the bounceback win. Tonight at FedExForum — and for the fifth time this season — the U of M erased the memory of a loss in its previous outing with a victory. And for the fourth time, the bounceback was decisive. The sparse crowd had barely tucked away its umbrellas before the Tigers knocked the Scarlet Knights off their proverbial horse. Behind nine early points from freshman forward Austin Nichols, the Tigers took a 22-3 lead eight-and-a-half minutes into the game. Back-to-back three-pointers by senior Chris Crawford four minutes later extended the lead to 37-9. Rutgers would not close within 20 points the remainder of the contest. "We didn't want the loss at SMU to really affect us," said Nichols, who finished with 18 points (on 8-of-9 shooting) in 27 minutes. "We trust the process. We played more inside-out basketball. If we continue to do that, I think we'll be a successful team." As for his performance, Nichols felt there was a right-place-right-time component to his highest scoring output since November. "It helps knowing my teammates have confidence in me," he said. "I felt like I was in the right positions at the right time. I kept running the floor. Teammates were giving me the ball in position to score." Nichols was but one of six Tigers with at least a dozen points, Joe Jackson adding 16, Michael Dixon 15, Shaq Goodwin 13, and Chris Crawford and Geron Johnson with 12 each. After hitting only six of 24 three-point attempts last Saturday at SMU, Memphis drilled 12 of 19 tonight, Crawford leading the way with four. The pride of Sheffield High School has now hit 14 treys in the Tigers' last four games. He also pulled down 11 rebounds and had five assists. As a team, the Tigers dished out 26 assists, the eighth time this season they've reached 20 dimes. "We played with a sense of urgency," said Dixon. "The seniors, we've got 10 more games [in the regular season]. We've got to play like we're in a fox hole. Memphis, now 17-5 (7-3 in the American) held Rutgers to 41 percent from the field. Kadeem Jack paced the visitors with 12 points. "It's gonna be fun," said Dixon with a grin. "I'm fortunate. I got to play in a 'GameDay' game [with Missouri] against Kansas. I know what it's like with all the fans, all the excitement." About Those Questions . . .
Last October, as part of our annual “Hoop City” issue, I presented ten questions for the 2013-14 Memphis Tigers. The answers would, in theory, determine how the season would be remembered. With February upon us — the NCAA tournament less than seven weeks away — let’s revisit three of those questions and see how close we are to the answers. • Can a lighter Shaq Goodwin be a stronger player? Two words: And how. The Tigers’ quartet of senior guards seems to be the opening talking point after every game. But it would take a remarkable two months of basketball from one of those guards for Shaq Goodwin to not be this team’s MVP. As a freshman starter — playing at 270 pounds — Goodwin averaged 7.4 points and 4.4 rebounds in 20.7 minutes per game, hardly the numbers expected from a McDonald’s All-American recruited to be the post presence Memphis sorely lacked over Josh Pastner’s first three seasons as head coach. But as a sophomore — playing closer to 240 pounds — Goodwin leads the Tigers in rebounding (6.7 per game) and is second to Joe Jackson in scoring (12.5). Against Houston on January 23rd, Goodwin scored 12 points in the first five minutes. With a pair of thundering dunks, Goodwin basically scared the Cougars straight before the FedExForum crowd had shaken the unseasonable chill outside the arena. It would be Goodwin’s fourth game this season with at least 20 points and his 13th in double figures, matching his total for such games as a freshman. “It’s all about focus,” says Goodwin. “Not bringing anything not to do with basketball on the court.” And about those guards: “We’re an inside-out team, so when we establish our presence in the post, it opens up the floor for our shooters.” Let’s consider Shaq Goodwin’s presence established. • Just how strong is the Tiger backcourt? In that loss to the Bearcats, the foursome missed 15 of 17 three-point attempts, as ugly a collective shooting display as FedExForum has seen in some time. In the loss to UConn, the best guard on the floor was clearly the Huskies’ Shabazz Napier (17 points, 10 assists). But the quartet has delivered in big wins over Oklahoma State, Louisville, and Houston (combining for ten three-pointers in the win over the Cougars). Each of the guards has scored at least 13 points in a game and dished out at least five assists. Johnson is second on the team with 5.3 rebounds per game. With Goodwin in foul trouble last week at UCF, the guards accounted for 51 of the team's 69 points. It may not be the best backcourt in the country, but Memphis leads the AAC in assists (17.5 per game) and steals (9.7). 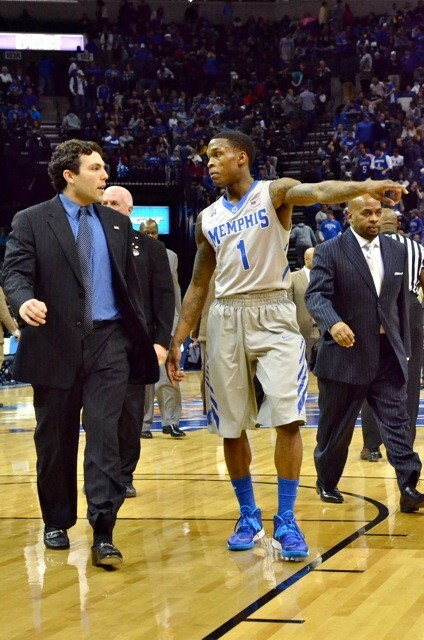 Pastner’s right: This team will play as deeply into March as its senior guards allow. 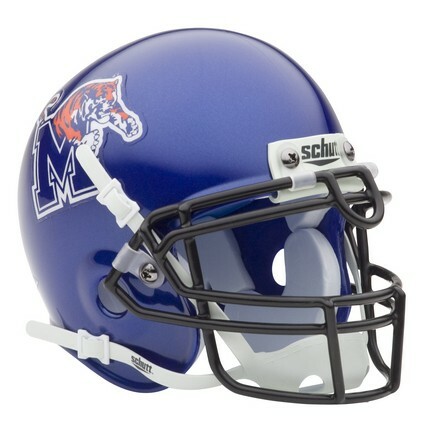 • Are the Tigers a tougher team than they were last season? Following the 21-point loss at Oklahoma State last November, chopping blocks were being dusted off all over Memphis. With Pastner’s name on them. Less than two weeks later, the Tigers beat those same Cowboys to win the Old Spice Classic in Orlando. After the dud against Cincinnati to open the new year, the Tigers’ strength relative to the rest of the American Athletic Conference was called into question. Five days later, they traveled to Louisville and beat the reigning national champions. This team has its weaknesses, many of them exposed last Saturday at SMU. Outside shooting is inconsistent, at best. (Keep your eye on free-throws, too. Games are won and lost in March at the foul line and this team has slung some uncontested bricks.) Defensive breakdowns near the basket are too frequent. The rotation is thin, freshmen Nick King and Kuran Iverson not getting the minutes many expected. But let’s not question the team’s toughness. They’ll take a knock-down, as they did most recently in Dallas. But they tend to rise. Consider the SMU Mustangs new members of the club. Conventional analysis has held that four teams will contend for the new American Athletic Conference championship: defending national champion Louisville, Connecticut, Cincinnati, and Memphis. If anyone needed convincing that Hall of Fame coach Larry Brown has the SMU program on new ground, this afternoon's blowout of the nation's 22nd-ranked team should manage the trick. So let's consider fully half the AAC contenders for a league crown, to say nothing of an NCAA tournament berth. Despite shooting 36 percent over the game's first 20 minutes, the Tigers entered halftime tied with SMU at 29. But a packed, if small, crowd in the newly renovated Moody Coliseum helped fuel a second-half onslaught by the home team that staggered Memphis and resulted in the Tigers' first road loss in American play. The Mustangs outscored the U of M 24-7 over the first seven minutes of the second half and extended the lead to 25 points (66-41) with 7:30 to play. Five Mustangs scored in double figures with senior forward Markus Kennedy leading the way (21 points) and freshman guard Sterling Brown hitting six of nine shots from the field for 15 points. Nic Moore added 14 points and Nick Russell 11. The Mustangs — leading the AAC in field-goal percentage — shot 58 percent for the game and held the Tigers to 40 percent (and an ugly six-for-24 from three-point range). The Tigers committed as many turnovers (16) as they had assists. It was that ugly. The only bright spots for Memphis were a pair of career milestones for senior guard Joe Jackson. With a season-high 22 points and six assists, Jackson surpassed 1,500 points and 500 assists for his career. In the long, proud history of University of Memphis basketball, only the great Elliot Perry achieved both totals. Geron Johnson added 18 points and Michael Dixon 13. The victory keeps SMU undefeated at home and improves its record to 17-5 (6-3 in the AAC). 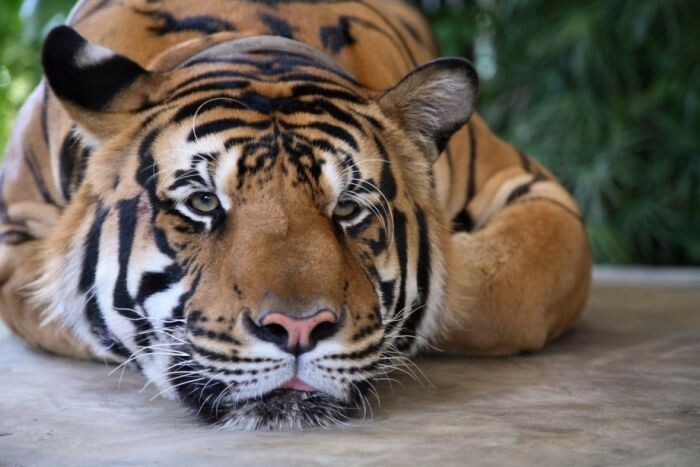 The Tigers fall to 16-5 (also 6-3 in the AAC, now three losses behind first-place Cincinnati in the standings). Memphis returns to FedExForum Tuesday night to host Rutgers before Gonzaga visits next Saturday for a nationally televised showdown, the Tigers' final nonconference game of the season.